Now then, these little beauties are my first attempt at men’s attire. I don’t remember making anything “male” when I was first sewing many years ago. The pattern is Simplicity 3971 which to my amusement is a unisex pattern, you will understand my amusement when we touch on the sizing later in the post. I decided to start with a pair of PJs for two reasons, number one, my husband quite liked the idea of handmade lounge wear and number two, I was reluctant to make a pair of trousers or a shirt in case I had another sewing disaster which wouldn’t venture out of the wardrobe; at least with these, only a select few people will see them in the flesh. The trousers were extremely easy, especially with an overlocker, sew the inside leg, middle seam, side seams, make the waist casing, insert the elastic and away we go, happy days. The shirt was more difficult, although the pattern was very easy to follow and the construction was quite painless. I revisited button holes and inserting a collar, both of which I haven’t done for some time now. The hardest part was matching all the stripes. When you’re dealing with so much material, it can be quite daunting. As I mentioned earlier this pattern is for male and female, now my husband is 6’3″, he is not a small chap by any stretch of the imagination. I did a bit of measuring, added a bit of length on the arms and legs and definitely cut the pattern to a size medium, make no mistake folks these are indeed a size medium. (I think he was in short trousers the last time he wore medium clothes) and they still swamp him, huge is not the word! 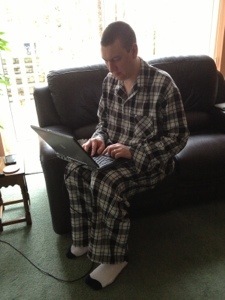 Anyway, we think jammies are most comfy when they are not restrictive and have more than enough room to lounge around in. I thought I would share this little story with you all. For those of you who are in the know, you will chuckle and also for those of you like me, who aren’t in the know, you will be soon. I received a message from my husband yesterday, telling me he had bought me a little present, oh I do like surprises, I couldn’t wait to get home to find out what it was. My husband had decided to do a little secret detective work on my behalf following my recent decision to look into buying a new sewing machine. You see one of the things I seem to be lacking with my current machine is the art of double stitching, I have so wished that my machine had the ability to hold two needles at the same time, this became more apparent last year during my knitted fabric phase, when I would stitch the hem and then stitch another line close to the first one. (I will add this isn’t the only reason for wanting a new super-duper machine). Anyway my husband managed to find a twin needle and bought me one. You can imagine my surprise at the gift (going red at the thought) I didn’t even know they existed, now do I feel a right numpty? Oh very much so! 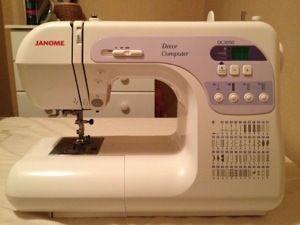 Do I still want/need a new sewing machine? (rubs hands together) of course I do!